Some of us might have a kid-like wish to see our favourite superstar carry the name that we are christened with. Here, we are presenting you the list of onscreen names of Ilayathalapathy Vijay over the 23 long years in which he has blossomed as a hero. Not often does an actor get to play himself on screen. On 9 occasions Vijay has been the onscreen name for our Ilayathalapathy, out of which only once he has reprised his own self on screen, in the movie Pandhayam which happens to be his only guest role in Tamil. 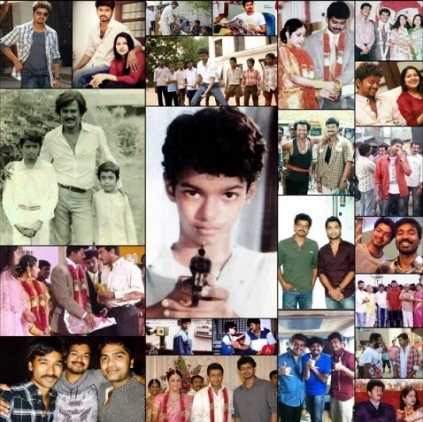 Vijay - Naalaiya Theerpu, Sendhoorapandi, Rasigan, Vasantha Vaasal, Once More,Endrendrum Kadhal, Nerukku Ner, Priyamaanavale and Pandhayam (himself). Jeevanandam - Kadhalukku Mariyadhai and Kaththi. Raja - Rajavin Paarvaiyile and Poove Unakkaga. Deva, Vishnu, Rahim, Balu, Selvan, Kannan, Ganesh, Gokulakrishnan, Vasanth, Seluvai, Kutty, Aravindhan, Sribadrinathamoorthy, Ashok, Surya, Bhagavathi, Boopathy, Sarathy, Thirumalai, Udhayakumaran, Saravanavelu, Maduravel, Sivagiri, Sukran, Sachein, Sivakasi, Aadhi, Tamizh, Gurumoorthy, Prasad, Vetrivel, Pugazh, Major Saravanan, Ravi, Sura, Bhoominathan, Velayudham, Panchavan Parivendan alias Kosaksi Pasapugazh, Jagadish Dhanapal, Vishwa, Sakthi & Kathiresan. On another note, 11 times the title of a Vijay movie has been named after the character that Vijay plays in that particular film - Deva, Vishnu, Bhagavathi, Thirumalai, Udhaya, Madura, Sukran, Sachein, Sivakasi, Aadhi & Velayudham. Will Puli make this list, a dozen long? Will Vijay carry a name like Pulikesi or Puli Pandi in the film or is Puli just a title based on Vijay’s traits, is something we will have to wait and watch. People looking for online information on Happy Birthday Vijay, Ilayathalapathy, Puli, To the Puli with love - HBD Vijay - Behindwoods, Vijay will find this news story useful.